Conventional practice is to build a number of individual nest boxes but we read in a book (on building chicken houses and runs) that hens often like to lay in the same place and end up squeezing into the same box, with a risk of broken eggs. We therefore built one long nest box (the size of four standard nest boxes, side-by-side) with one entrance and no divisions; we’ve found this to work very well and when we open the nest box each day, we find the eggs in one collection, sometimes with an odd one the other end of the box. If two hens are laying at the same time, they often cuddle up close, seemingly trying to squeeze into exactly the same place. 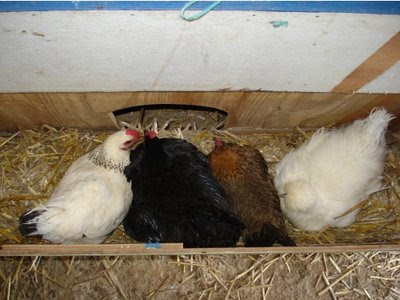 The photo at top shows four hens squeezed in together, two broody and the other two laying. When one of our hens goes broody, we try to separate her from the others and perhaps add other eggs to make up a decent clutch, even swapping small bantam for larger (and therefore more interesting to us) eggs from our full-size birds ... cuckoo! This spring, we had several of our hens go broody at the same time, using up all our alternative accommodation, so that our two Silkies ended up sharing the chicken tractor. (The Silkies are the white ones with Parisienne hairdos-see photo.) As this happened all of a sudden, reducing our egg-laying population drastically, so that we hadn’t got nearly enough eggs to put a clutch under each one. The Silkies, sharing accommodation had only two eggs to share. One each? No, one on both and then, when she goes for a drink and a bite to eat, the other one seizes the opportunity and sits on the eggs. When both eggs hatched out under one hen, they remained hers, the other hen staying in the chicken tractor in her new role as attentive aunty. We had something similar last year, again with the two Silkies, when one unfortunately lost her chick to a rogue tomcat. We tried to put her back with the rest of the flock in the henhouse but each day, when they were let out, she went straight to the chicken tractor. We let her back in and she became aunty to the other Silkies two chicks, the other hen tolerant of her “sister” (hens with chicks can be very aggressive towards each other) yet it was always clear to see who was the real mum. I say real mum, what ever eggs hatch out under a hen, she’ll treat them as her own, which is, I suppose, how the cuckoo gets away with it. 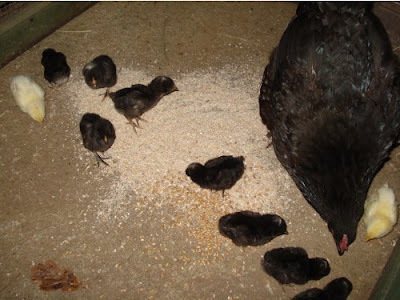 If, for various reasons, the first eggs don’t hatch or there are other problems, you can put more eggs under the hen, who will continue to sit. We’ve had hens sit through six weeks, i.e., twice the normal gestation period of three weeks, and then hatch out chicks. We’ve also had hens who have given up during the second sitting, leaving the eggs to go cold. Of course, its a shame to crack open the eggs to reveal well-developed embryos that have died but you’ve got no control over it. With the dates marked, if your vigilant and have other broody hens, you might be able to transfer the eggs to another sitting hen. I realise I still have many other mysteries to reveal, so hold your permacultural breaths for Part 3. Chickens sure are funny! Loved to keep them when I could. We've got a broody hen and I don't know what to do with her! My neighbor has told me I need either a bucket or a trap to get the hen 'off the cluck'. It depends what you want to do with your broody hen. Do you want to put some fertile eggs under her and have chicks in three weeks time? If her broodiness is inconvenient, then you need to build a "broody" coop", a cage with a weld mesh floor to allow an uncomfortable cold draft around her belly and put her off being broody. Just feed her on plain wheat and make sure she has water.